Every prospective bride dreams of the day she will walk down the aisle toward her groom in a location enhanced by gorgeous flowers. Choosing those flowers is an important step in planning her dream wedding. 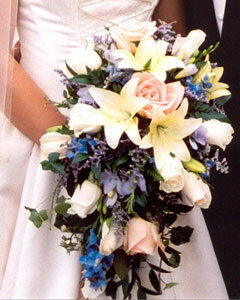 Flowers add fragrance and beauty to the wedding, and her bridal bouquet is the floral centerpiece! 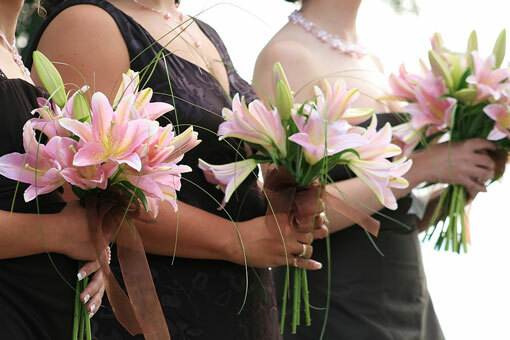 As well as selecting the flowers for her bridal bouquet, she will want to select flowers for her bridesmaids, groom, groomsmen, other family members, and the wedding and reception sites. The flowers chosen for these areas will all take a cue from those selected for her bouquet. Which style is your wedding gown? What atmosphere and style do you wish to convey? Will your choice be casual, formal, traditional, or modern? Is the wedding outdoors, in a church, or at another site? During what season will the wedding take place? Which flowers are available during Spring, Summer, Fall, or Winter? Will a florist design your bouquets, or will you or a friend do the work? Do you want to use silk flowers or fresh flowers? Do you have a specific flower in mind? What is your budget? Consider that exotic flowers will be more expensive than readily available ones. Can you recreate an expensive floral bouquet with less expensive flowers? Fresh flowers may be available from a friend's garden, and many grocery stores carry a good selection of flowers at a reasonable price. This website can help you make the right floral choices to enhance your wedding day and surround you with fragrance and beauty. When the time comes to order wedding flowers, shop around for a reputable local florist who can help you with your wedding bouquet, wedding corsage, and boutonniere requirements. Wedding Bouquets: Over 300 Designs for Every Bride is a fascinating book that includes close-up photos and detailed descriptions of each bouquet design.